You name it, they will be brewing it soon. THE WORLD’S BIGGEST brewer will team up with its nearest rival to create a behemoth of beer-making with interests in half the globe’s top-selling brews. Belgian-Brazilian giant Anheuser-Busch InBev, which includes Budweiser, Corona, Beck’s and Stella Artois among its many brands, has agreed to pay £71 billion (€100 billion) to take over South African brewer SABMiller. The combined company would control nearly one-third of the global beer market and account for roughly half the industry’s profits. As part of the deal, SABMiller will sell its majority stake in the US MillerCoors operation to business partner Molson Coors for $12 billion (€11.2 billion) to help smooth the deal with regulators. That will spare beers like Coors, Miller and Blue Moon from coming under the reach of the newly merged company, although it will keep other SABMiller brands such as Foster’s, Peroni and Grolsch. 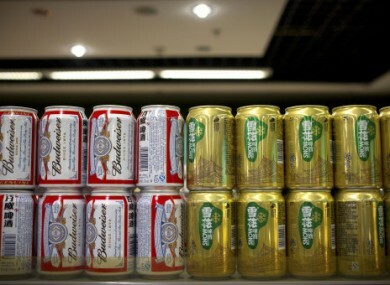 The deal will give InBev better access to fast-growing emerging markets like Africa and Asia, where SABMiller is involved in Chinese joint venture Snow – the world’s top-selling beer by volume. The transaction is expected to be completed in the second half of next year after both companies’ boards approved the merger, the third-largest in corporate history. However it still needs to clear competition regulators and the two firms’ shareholders, and more brands may need to be left out of the agreement to win various authorities’ approval. Chinese regulators have previously barred the pair from cooperating in the country. In a statement today, InBev said the deal would “create a truly global brewer, drawing on a similar heritage and shared passion for brewing and commitment to quality”. The combined brewing giant would be able to find “synergies” – more commonly known as ways of cutting staff and other costs – worth at least $1.4 billion (€1.3 billion) a year. Email “Most of the big beer brands the world drinks will soon come from just one company”. Feedback on “Most of the big beer brands the world drinks will soon come from just one company”.